New Website HippoCampus and it has FREE resources for you and your students. Here is a very exciting new website that I ran found today. It is called Hippo Campus http://www.hippocampus.org/ . It is a website that has online tools to help a student that has missed a class objective or needs reinforce for mastery of a class objective. There are short video or animated clips talking about the subject, and then it has students practice what they have learned. Also this website is align to some textbooks, this way you can have student access content in the order of the chapters. Also you have the ability to create a site for your classes at Hippo Campus. With this you can then edit the left tool bar so only the Items that you teach will show up there. There are also test question on the site for the students to be able to do a self assessment of knowledge. Hope you enjoy this and please let me know if you are using it and how it works out for you. What is PEG it is the Public Education and Government network. With the passage of PA 480 in Michigan it has cause many issues with cable TV, Higher Rates, No extra created completion as suggested under the bill and take local control of franchise way from the city, Villages and townships. the link below is a paper wrote on how PA 480 has effected education and 10 reason why PA 480 has not done what was promised. Some of are school with the passage of this bill have seen the public network channels adversely effected. I would like to take a moment to thank Mi-NATOA.ORG for their work on this issues in Educational Technology. Michigan Cyber Safety Initiative is a great program! Protecting children from predators is one of my top priorities. Predators today typically use the Internet to befriend, seduce, and ultimately harm children. Putting these criminals behind bars is not enough; we must also proactively combat the problem by educating children and adults. The Michigan Cyber Safety Initiative (Michigan CSI) is an Internet safety education program with customized presentations for kindergarten through eighth-grade students and a community seminar. They have invited all public school district superintendents, intermediate school district superintendents, Michigan Dioceses, Homeschooling Michigan members, Michigan Association of Non-Public Schools members, and Michigan Association of Public School Academies members to participate in the Michigan CSI program during the 2008-2009 school year. Registrations are now being accepted. Encourage your school to become a leader in cyber safety education and to submit a Michigan CSI registration form as soon as possible. We had them into are school and it was a very good presentation by them for the children of are school. 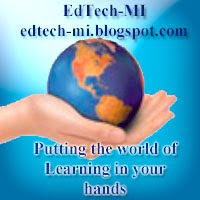 This will be a place for us to share educational events on technology. If you have an event that you would like listed please contact me. I will be glade to add them to the google calendar on this blog site. The calendar is placed at the bottom of this blog site. - ANGEL Learning Management Suite, ANGEL Learning, Inc.
- ClassLink ClassMate, ClassLink, Inc.
- Review360, Psychological Software Solutions, Inc.
- Adobe Captivate 3, Adobe Systems, Inc.
- http://www.excelsiorsoftware.com/K12solutions/pinnacleSuite.aspx, Excelsior Software, Inc.
- Wimba Collaboration Suite, Wimba Inc.
- Adobe Acrobat 9 Pro, Adobe Systems, Inc.
- Gaggle.Net Student Email and Collaboration Tools, Gaggle.Net, Inc.
- ePals Global Learning Community, ePALS, Inc.
- Kidspiration 3, Inspiration Software, Inc.
- RtI Package for the Academy of READINGï¿½, Autoskill International, Inc.
- World Book Discover, World Book, Inc.
- ClassLink CLiC (ClassLink Information Console), ClassLink, Inc.
- Instructional Management Solutions (IMS) Suite, SchoolNet, Inc.
- EXCEEDtm, Spectrum K12 School Solutions Inc.
- EduTone Xchange Platform, VIP Tone, Inc.
- ClassLink LaunchPad, ClassLin k, Inc.
- Carnegie Learning Adaptive Math Solutions, Carnegie Learning, Inc.
- SmartMath, Encyclopedia Britannica, Inc.
- SAS Curriculum Pathways, SAS Institute, Inc.
- Jenzabar's Learning Management System, Jenzabar, Inc.
- McGraw-Hill Learning Solution's Katana, The McGraw-Hill Companies, Inc.
- Jenzabar CX, Jenzabar, Inc.
- Jenzabar's Non-Traditional System, Jenzabar, Inc.
- Parature Customer Service Software for Education, Parature, Inc.
- Regent Enterprise, Diamond Edition, Regent Education, Inc.
- www.kdsi.org, Knowledge Delivery Systems, Inc.
- eCDA, Teaching Strategies, Inc.
- ClassLink LaunchPad, ClassLink, Inc. I thought I would write a Blog about are next-door neighbors Illinois Computing Educators. Last March I took a trip with some other educators to Ohio Department of Education to find out what Ohio was doing as it relates to consolidated network centers and also there state wide computer network. I think it is very useful to-do site visits to other schools and state to see what is happening around us. I have learned a great deal from these experiences. I would encourage you to make appoint to visiting your next-door school district or state to see what innovative ideas that they may have to share with you. Here are some details about Illinois Computing Educators (ICE). The mission of Illinois Computing Educators is to lead the educational community in enhancing learning through technology. Illinois Computing Educators is the leader in supporting and promoting innovative education for all. PROFESSIONAL DEVELOPMENT: Support and provide professional development opportunities in educational technology through collaborative communities. Build relationships with other organizations by being the premier education technology visionary and voice for Illinois. Forge partnerships to advance 21st century digital literacy. MEMBERSHIP/CHAPTER DEVELOPMENT: Increase ICE membership by creating new chapters and affiliations, attracting new members, and strengthening existing chapters. OUTREACH/EXTERNAL COMMUNICATIONS: Become the recognized educational technology portal. Increase funding through partnership, sponsorship, membership and grant writing. Improve collaboration and communication for members through print and interactive tools. MIT OpenCourseWare 1800 event: Unlocking Knowledge, Empowering Minds: A Milestone Celebration. The event celebrates the publishing of the 1800th course on MIT OpenCourseWare. Maybe we should consider doing this type of thing in K-12 Education. Making IT work as one Video. Podcast on Technology educational issues wanted.... Have an Idea for an educational Podcast as it relates to educational technology and student learning. Record your points of view, innovative technology ideas and send me a link were I can download them, as most are to large for email because of there size. If they are small enough you can try to send them to [sharpstf@gmail.com]. If you need a place to upload it let me know and we will work something out. After getting the podcast I will listen to them and then places them on my blog site. I look forward to hearing your podcast. Try to keep them from 5 to 10 min. Here is a very neat site that allows you to have Free AudioBooks for your students to listen to as they follow along in there books. YouTube interview with Jim Collins about Good to Great. I think that this can also be used with Schools. Who moved my Cheese this is a great book to look at how change is importand. This YouTube video is a book review of who moved my cheese. If you are in education and technology this is a must read book. 3 Steps for 21st Century Learning Century Learner. Here is a YouTube Video of the vission of are young people and what they believe as it realtes to Technology and Learning. Here are the survey results of 296 teachers in the state of Michigan and what they think about Online Learning and Virtual course work. I will post my research paper as soon as it is one in this blog also. Please send me your thoughts on this at. Wow this is a phenomenal amount of live streams; we are reaching a time when communications on the internet is reaching a huge tipping point. In other words, with all this video taking more and more bandwidth from the Internet we will see more latency continually. Obama has shown us the way to connecting to the common person. It also shows that the common person is well connected. We can move many people with just a few clicks of the keyboard. Today on television news show they collected 35,000 plus photos in just a short period of time. I placed a survey online this weekend and sent a letter to the MDE technology list server and ask the directors to ask there teachers to voluntarily take it. With in two hours there were 135 users that had taken the survey. The speed of information is growing as we become more interconnected. We as a country need to invest in the backbone infrastructure of the internet. We also will need this structure to help consolidate server rooms across the state. We have seen bandwidth go up exponentially as we stream more video for online learning courses. We also see this inter-connecting of are student with the use of cell phone. I saw a group of twenty high school girls all with there cell phones open texting with there friends. I kiddingly told them you know you can just talk to each other, they all just smiled and laughed, like what planet is he from.